We install top-quality replacement storm doors in Wisconsin. 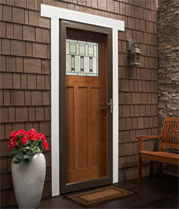 HomeTowne offers Pella and Provia storm doors to complete your entry system. Door styles range from the more formal removable glass full lite doors to the versatile "Rolscreen" retractable doors with built in screens.